Rental rates continue to rise in St George and across the country based on research from RentRange. The national average increase in the rental rate for a three-bedroom single family home was 4.8% year over year. Through the third quarter of 2016, home rental rates increased nationally from $1,393 a year ago to $1,459. The rate of increase varied from a low of 1.8% in the Southwest to a high of 7.9% in California, and the average rent ranges from a low of $1,078 in the Southwest to a high of $2,288 in California. 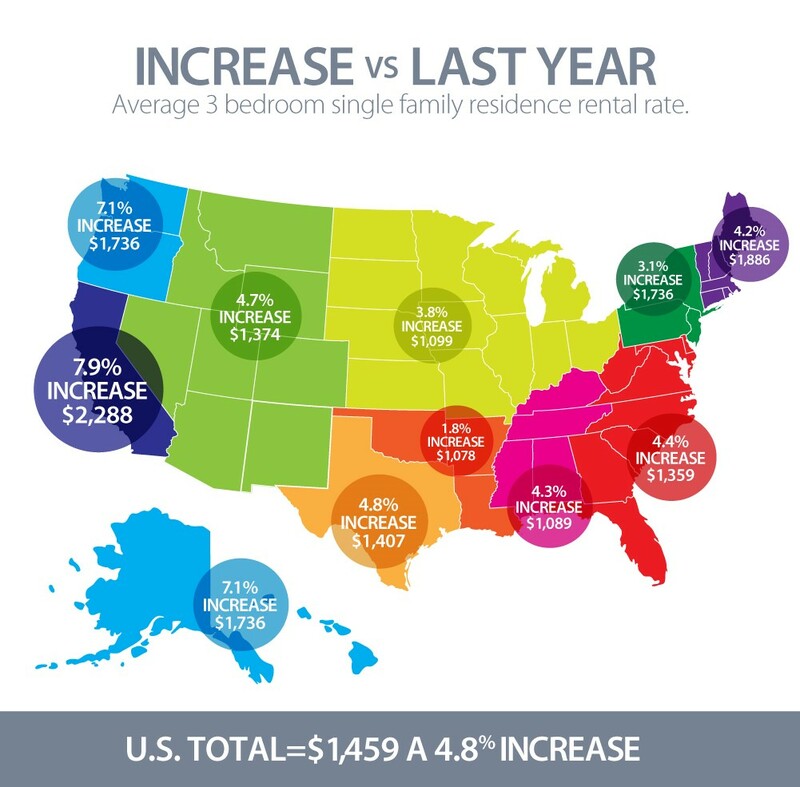 See the illustration below for the average rental rates and rate increases by region of the country. It is no surprise that the two areas with the highest and lowest rental rates also experienced the highest and lowest rental rate changes. California, with its growth and new construction restrictions, has an imbalance of supply and demand. This combination has resulted in the highest U.S. rental rates and the highest rental rate increases. In contrast, the new construction in the Southwest has kept pace with population and job growth, so supply and demand is near equilibrium. According to the U.S. Department of Commerce/Bureau of Economic Analysis, personal income has only grown an average of .34% for the past five months. This means that on average, renters are spending an increasing amount of income on rent. Unless the supply of rental housing and new home construction increases, this trend will continue. Nationally, vacancy rates were 5.2% for a 3-bedroom single family home through the third quarter of 2016, down modestly from the 5.3% a year ago. The estimated percentage of single-family homes as a share of all single-family homes was 25.3%, which is the same as last year at this time. As leaders in the rental housing industry, the Real Property Management franchise and RentRange have an ongoing strategic business relationship. Real Property Management offices rely on RentRange’s proprietary rental housing data to provide landlord customers with accurate, current information about local rental properties and rental markets. Customers interested in a fresh analysis of their property’s competitive rental rate should contact their local Real Property Management office. RentRange is the nation’s leading provider of Rental Market Intelligence™ to the financial services and real estate industries. It delivers rental data and analytics as well as rent-based valuation solutions for single-family properties, with products that include on-demand automated rent valuation reports and subscription-based data available. The company is owned by Altisource Portfolio Solutions S.A. The Real Property Management organization has partnered with RentRange to obtain statistically valid rental rate information for nearly a decade.